I was amazed at the level of acceptance and compassion my kindergarten students had toward each other. One minute they wanted to hit someone (and some did) and five minutes later all was forgiven - on both sides. 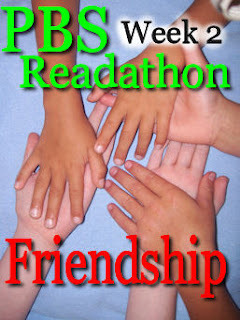 This week's Readathon ebooks are about Friendship. The Stickfiggy books have adorable illustrations and sweet messages providing incentives to help your child read, form friendships and even exercise. These action word stories are designed for word recognition and early reading practice. Lott is going to host a tea party. But there are so many things to do! Help your child learn many simple action words as Lott twirls through her chores and preparations: Think, invite, sweep, vacuum, decide, choose, leap and many more. Check out the Action Cards for this book at Carrots are Orange. Also, Putti Prapancha, The Educators’ Spin on It &The Usual Mayhem have great visuals to help you extend the tea party theme into action. 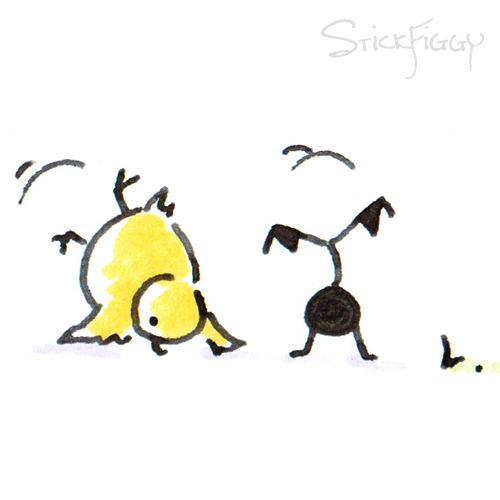 This delightful book shows Stickfiggy walking, standing upside down, doing a happy dance, pulling, leaping... 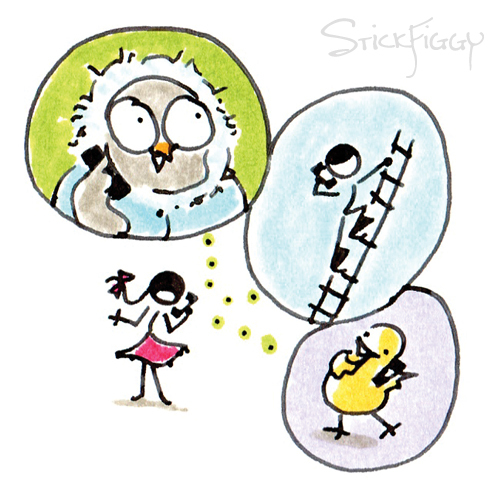 Your child could make his own Stickfiggy or friendship book. Jane Marshall, the author of the Stickfiggy series, has made a free printable to help you get started. I still love to draw stick figures and your child will too. Children with Special Needs were always welcome in my Kinder class (previously taught Sp. Ed and daughter has special needs). I was often impressed with how easily the "regular" ed. students became friends with children who had handicaps. A blind child may need help carrying books. A child in a wheelchair may need someone to push the chair. A child with Down Syndrome might need a friend to play with at recess or sit with at lunch. A child with autism might need a good listener. An emotionally disturbed child might need a good role model. A depressed child might need a hand to hold. Young children are more accepting of students with disabilities than some adults. We could learn a lesson from them. You can have access to over 20 free ebooks right now by creating an account on MeMeTales.com only once.Then read together on your preferred platform of computer or apps for iphone/ipad, Android or Kindle Fire. The books should be available on Nook soon. For more information and to join click: How Do I Participate in Readathon 2012? For every child joining the Readathon, MeMeTales is donating a meal to send a hungry child to school via FoodForEducation.org. Want to help? Tweet using hashtags #readforgood, #MeMeTales, and #kidslit. Last week 1,256 kids read 12,658 books due to this Readathon. Current figures here along with a Friendship Cookie Recipe and links to more participating blogs. To Have a Good Friend - Be a Good Friend. You might enjoy my recent guest post Promote Early Literacy through ACTION! For a glimpse into Kindergarten, see my book. Coming soon: The Happy Mommy Handbook. Disclaimer: I will be receiving the featured books and in exchange I’ll be sharing activities and ideas related to the theme of the week as well as promoting this program. Some great ideas here! I like the ideas especially on how to be friends with others who have special needs. Thank you for mentioning autism and depression in particular. Not all special needs children look different and to a child it's not always obvious. Right - it was easy to guess who the future nurses, doctors, social workers, teachers would be because they were eager to help those who needed a friend. I love your blog and Readathon ideas and activities. Great idea to cover characteristics of a good friend while we read these friendship themed stories! Maya - I am so happy to help with your wonderful Readathon. The books are amazing and helping hungry children too. Amazing. Thank you for visiting. I love these ideas! What wonderful reminders of how to be a friend! Thank you. Your Readathon post had some great ideas on friendship. It's a great Readathon! Thank you for visiting. Thanks, Susan. I like the ideas about how to be a friend. Especially the ones for helping kids with special needs! Thank you Bethany. I really appreciate that. Everybody has needs - some are just more visible than others. Love your Readathon ideas. Such a great project. I have never heard of these books before. These are great lessons for children. Sometimes it is hard for young children to make friends especially if they are at home with mom most of the time. Reading books about friendship, like these, are great to prepare your child for a play-date or simply going to the park. Thanks for linking up at Mom's Library!